Writing about the Mechanics Institute chess club started me thinking about other chess clubs that I’ve played in. Although I played in school chess clubs from about eighth grade all the way through graduate school, the first club for adults that I ever went to was the Richmond Chess Club. My family moved to Richmond, Virginia, during my first year of college (1975). Because I was in college most of the year, I lived in Richmond only during the summers, and I barely knew anybody there. The chess club was almost the only social activity I had, besides my summer job. The chess club was held every Thursday night at the Virginia Home, an assisted-living faciilty in a very picturesque part of town. As I wrote in my diary at the time, “At first I was a little uneasy about going to a home for the disabled.” I think now that I was more than a “little uneasy.” I had not spent much time around older people or sick people, and I really didn’t understand them very well.Â The fact that they looked ugly, or deformed, meant to me that they somehow weren’t good or complete people. After all, isn’t that the way it is in Disney movies? The heroes or heroines are always young and beautiful, and the villains are old and twisted. The same ruthless code of judgement based on external appearanceÂ applies in high school, too. The popular kids are the good-looking ones, and if you are ugly or deformed in any way, you’re a social outcast. The main reason the club was held at the Virginia Home, I believe, is that it was where Jesse Burke lived. He may have been the founder or organizer of the club–I’m not sure–but he was certainly its most visible presence. He was completely confined to a rolling bed, not even a wheelchair because he couldn’t sit up. He had Coke-bottle glasses and twisted-up hands whose fingers all went the wrong directions. If I remember correctly, he moved the pieces with a long stick, sort of like a back-scratcher. I don’t think I ever actually played Jesse, because I was both repulsed and a little bit afraid of him. But there were plenty of other people to play with–younger people closer to my age and ability. Also, some “big names” of Virginia chess, such as former state champions Ed Kitces and Charlie Powell, would show up now and then. One time, in 1978, a newspaper reporter came to write an article about Jesse and the Richmond Chess Club. Here’s what I wrote in my diary: “He looked amazingly like my stereotype of a cub reporter–skinny, bookish, very ill at ease until he started interviewing people and filling his very conspicuous notebook with pages of notes.” So what’s wrong with that? Somehow I thought it was funny that he looked so much like a reporter, but what else is he going to look like? And it’s a good thing that he took pages of notes! That’s part of his job! Well, life has taken its revenge on me, hasn’t it? Now I am a reporter, and when I went to the Mechanics Institute this week I took along my notebook, took lots of notes, and probably looked just as ill at ease as this guy did. Finally the newspaper article came out, and it was a long article full ofÂ information about Jesse Burke’s life. I wish I could remember it (alas, the online archives of the Times Dispatch don’t go back to 1978), but I do recall that it said that Jesse Burke had juvenile arthritis. Of course it had never occurred to me to ask him about his disease, and I had never realized that he had a lifeÂ before he was confined to the Virginia Home. Probably with modern treatment his body would not have gotten so ravaged by the disease, but in the 1910s and 1920s they didn’t have the range of anti-inflammatory drugs that we have today. I wish I could say that the scales fell from my eyes after I read this article,Â and I became less judgmental about the way that people look. No, it took time and maturity for me to reach that point. But maybe playing chess at the Virginia Home got me started. I wonder if chess clubs were once all located in strange places, such as the Virginia Home. When I joined Ajedrez Madrid it was in the alleyways behind La Gran VÃ­a, Madridâ€™s main thoroughfare, in La Calle de la Libertad (the Street of Freedom), an area frequented by the lesser reputable citizens, and quite dangerous at night, although no one ever got mugged or was hurt that I know of. The crisis came when we were asked directly to go out and stick posters on the city walls and just as directly refused. We finally relocated to a Catholic school in the working class district of Tetuan. It is ironical that in those days the capitalist free trade economy pushed us into the clutches of radical socialism and/or the Church; sort of like a rock and a hard place, or Scylla and Charybdis if you prefer the highbrow version. Istarted in a chess club when I was 7 years, before that I had played about a year just learning the rules at a school with other children (my sister and brother included) and a funny teacher I still see at tournaments today. I’m still grateful for that introduction to chess, as just a family thing with my siblings and mother (my father took no part yet, which contributed to the peace of it). The club was in a communy house where artistic, elderly people also came to paint on silk and canvas. The most fascinating part of the club to my conscious mind, was not the chess which I just played like usually, but the paintings and the windows I could look through to into room full of bottles of paint and brushes and tables spotted with paint. 😀 The paintings on the walls were replaced frequently, which I was happy about because I found them very absorbing/magical. I remember that occasionally at tournaments there would be a person who was handicapped/pretty misbuild. I didn’t think about it much, but when I played such a person my biggest issue was that I was afraid to offend him or be rude to him, or let it show that I was disturbed to confront a “freak” (especially in the way a person with really short arms would twist around just to pick up the pieces, and be careful to drop them in their right places), I was uncertain how to act, which I guess isn’t so weird for kid, since even adults are sometimes uncertain. It was important for me to appear respectful, because of the occasional discrimating behavior of boys who felt uneasy playing a girl. I think this made me a bit more open to other people as well, trying not to judge people just because of this or that superficial thing. Carina, do you think that your interest in combining chess and art started because of that first chess club you went to? We have a player in northern California who is a strong master, and has a disability that forces him to move the pieces in a “funny, twisting way” just like you described. He can barely reach the other side of the board, and sometimes needs some help to move his pieces that far. But he has the most perfect, impeccable handwriting! It’s as if he’s saying, “Even if my arms are only a foot long, I can do this perfectly.” He also has a great sense of humor and is a popular chess teacher. I’ve actually been pondering that myself since yesterday, I haven’t thought about the influence it might have had to spend time in those rooms with paintings on the walls, and peeking through windows to dark (mysterious) rooms full of materials. It was very interesting to roam around as a kid. 😀 The building had two floors and seemed very big. It was a nice place for a chess club, although the club isn’t there anymore. It’s cool to hear success stories about challenged people. In jiu-jitsu there are sometimes cases like that too, where a dwarf with one arm totally wraps up normal competitors. Like they have developed aspects of their games to the extreme, compensating for what everybody think they couldn’t live or function without. Personally, I envy people with neat handwriting. People are often surpriced that I draw well, but write almost rebelliously. The words and even the letters within the words fly independently around, up and down, with spaces in between that are as big as the moment decides. It looks like my brothers handwriting, only in a more dissolved version. My sister’s is really neat, however: I think that’s always been her pride.. snakey, curly letters that repeat themselves with the accuracy of a computer, and looking at a whole sheet of it is almost an aesthetic experience! I’ve just long ago decided to scoff at it, though. Everything’s up to interpretation, and I’ll just say my handwriting is caused by artisticness (not lazyness (the real cause)). I’ve actually bought a book on caligraphy and a pen and ink a long time ago, but never managed to get into it. For some reason, I’ve grown up with a stupid attitude towards orderly writing, and some day I’ll have to seriously work to improve on it. This is especially important for my chess notation. Actually, having beautiful game scores is my key motivator for doing any work with it. I’ll have to memorize pretty letters, or something! Thanks for your e-mail, Craig. It’s nice to see that if you write something good about somebody, eventually it will get noticed. Actually, I’m afraid that some of what I wrote wasn’t even that flattering, because I was remembering my immature reaction to disabled people as a teenager. But I’m glad that Craig saw my intentions. 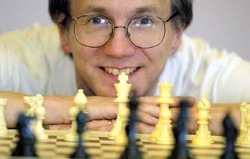 Interestingly, a more recent issue of the Virginia Chess Newsletter at http://www.vachess.org/news/2009-3.pdf also has an account of Bobby Fischer’s simul in Richmond. The 2009 article also has the score of Charlie Powell’s 21-move victory against Fischer, if anyone is interested. I knew Jesse Burke and Charles Powell quite well in the 60s, played both of them and only occasionally won, more often I lost. I played Bobby Fischer on the night of his simul, lost very quickly — but I remember that *he* lost four games in all, including the one to Charles. Really glad to have come upon this thread to refresh my memory. I used to play at the Virginia Home — and yes, Thursday nights is my memory as well — as a 11-12 year old boy during the era of the meteoric rise of Fischer against the USSR. I remember Jesse well (glad to recollect his last name Burke after reading this post) — I never played him either, but he was indeed a prominent presence. I too was alarmed as a young boy by the ravages of his disease, but he was a very sweet man. And I do also remember Charlie Powell and Ed Kitces, as well as Jim Snapp and my wonderful old mentor from those days, Max Lipmann and his sweet (but mentally failing) wife. It was a very strong chess club, and I treasure the memories of the people there, as well as the feeling of my brain growing from all the time spent in mental concentration there. My understanding, based on information obtained from Charlie Powell in the early 1970s, was that the Chess Club met at the Virginia Home because Charlie’s father, who had multiple sclerosis, had been living there. Charlie visited him frequently to play chess and the chess club grew from those visits. I’m not sure if this was the origin of the club, or only the reason for its meeting place. However, later, Jesse Burke became a seminal member of the club. The desire to include him became an important factor in its continuing in the same location after Charlie’s father died and even after Charlie moved to Williamsburg and attended only occasionally. Just to note a sign of the times: The Virginia Home was then called the Virginia Home for Incurables, and only later shortened to the more euphemistic–and appropriate– Virginia Home. What a nice surprise, to stumble onto this page of Virginia chess memories from the 1970s. Dana, you may remember me by my former surname (Chiminiello). I played in Ohio during the 1990s. But in the mid-1970s I played on the team at Prince George High School; was rated ~ 1500. Became interested in the USCF following a Jim Snapp lecture at the Fort Lee army base, and recognize many of the other names mentioned here. Never spoke to Charlie Powell but watched him with awe. There was a player from Thomas Dale High School — surname Todd (I think) — who was very strong. Probably the strongest high-schooler in the state at the time was Macon Shibut. Thanks for the brief stroll down memory lane, and best wishes to you. Mark, Yes, I do remember your earlier surname! We should have a club for people who change their names. In the era I wrote about here my last name was Nance, and I changed it a few years later to Mackenzie (ironically, not long before I moved to Ohio). Anyway, I’m glad you enjoyed this and also glad that this post somehow keeps finding new readers so many years after I wrote it. Next post: Best country for chess?